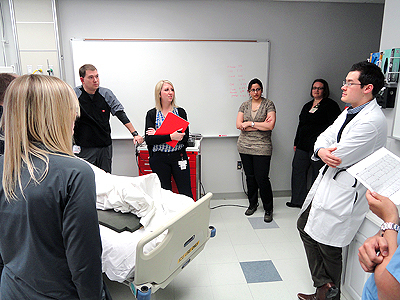 Medical residents at the University of Louisville benefit from consistent bedside teaching and evaluation on ward rotations and in clinics. The residency program provides each resident with access to both MedStudy and MKSAP, resources that they will use to prepare for the internal medicine boards. All UofL house officers have free access to multiple on-line resources through the UofL Kornhauser Health Sciences Library, including UpToDate, DynaMed,and PubMed. Our program also offers a full schedule of complementary lectures and teaching conferences. Residents present reviews of overnight admissions and interesting inpatient cases every Monday, Tuesday, and Friday at noon. Interdisciplinary conferences with the departments of pathology and radiology are also offered at this venue. Provides a forum where faculty and residents discuss articles of interest with an eye toward evaluation of research methodology. Every Wednesday afternoon, faculty present two 45-minute high yield lectures. Sessions are recorded and are accessible by web, should a resident be unable to attend. The residency program recognizes that adult learners may prefer to explore topics at their own pace and in an order that coincides well with their clinical experiences. We also recognize that self-study is crucial to building a broad and deep foundation of knowledge in internal medicine, and to passing internal medicine boards. This curriculum provides residents with guided self-study using online, case-based resources and board review materials. Advisors monitor resident's progress through the curriculum to ensure completion during residency. Begins with an interactive learning session on a single topic pulled from the Yale Curriculum. Additionally, faculty may ask residents to perform brief literature searches on patient-focused questions in an effort to deliver the best and most evidence-based care to our patients. Medicine Grand Rounds are held every Thursday at 8 a.m. during the academic year (September-June). Speakers with regional and national reputations are invited to campus to update the entire faculty on controversies and developments in our field and on new advances in research. Our educational program grounds residents in the principles and fundamentals of Internal Medicine and prepares them for a lifetime of learning and of delivering superb clinical care. LouisvilleLectures.org is a resident launched project that provides updated boards and clinically relevant lectures on a range of Internal Medicine topics. We record all of our internal medicine didactic lectures and we publish the best online. This project isn't just for the benefit of our residents; we want to help teach the world internal medicine.